The spiral, the hand and the ménorah. Museum of Jewish art and history in Paris: the visual identity. La spirale, la main et la ménorah. Musée d’art et d’histoire du Judïsme à Paris: l’identité visuelle. The Museum of Jewish Art and History opened in 1998 in the Marais quarter of Paris. Following the competition for the visual identity of the museum, the application of the graphic designer Philippe Apeloig was accepted, but at the same time the jury asked ihm a new concept. Philippe Apeloig imagined a different path, simpler and more obvious, but also less original: the menorah, the candelabrum with seven branches. And so he began to evaluate how sensitive the subject is, how strong the contradictions and the constraints are. This book retraces the development of his thoughts, his iconographic research and his sketches. The story of Philippe Apeloig’s development of the visual identity for the Museum of Jewish Art & History in Paris speaks of the struggle between the free creative gesture and caution. 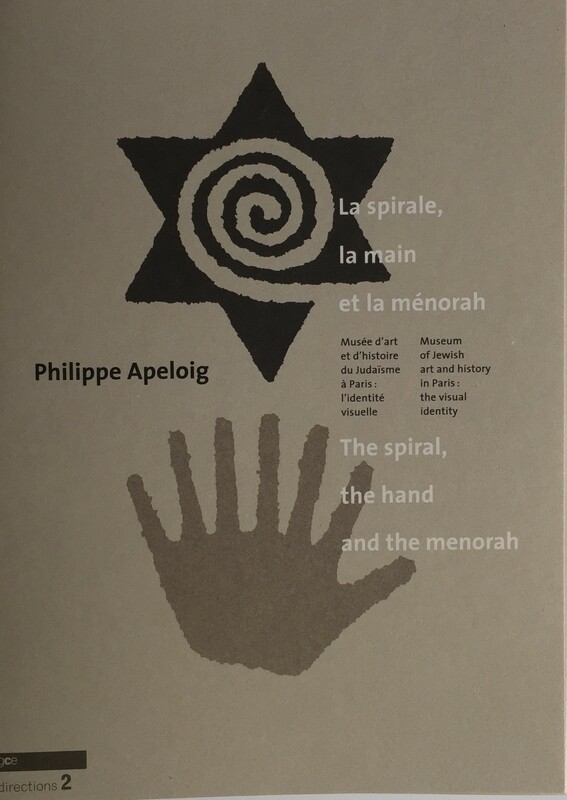 French graphic designer Philippe Apeloig won the competition for the new Museum of Jewish Art & History’s new inentity with two concepts – a spiral in a star and a hand with seven fingers. Approaching the task in a symbolic and allegorical manner, the designs explored associations of traditional Jewish emblems, the modern world and emotion. Four symbols were chosen for exploration: the spiral; the Star of David; the hand; and the Menorah – all well-known but, in combination, new meanings might be found. The spiral is related to the concentric circles in the Cabala, to a cross section of the Torah; it evokes the unfolding of life, the theme of birth and extension, says Apeloig. It’s also a symbolic interpretation of history. The starting concept was a spiral piercing a Star of David illustrating the intimate relationship between the Jewish community and the outside world and a desire for integration and emancipation, says the designer. However, he says, this symbol alone could not fully express the concept of the museum. Combining several symbols was the way ahead. The hand symbol is the hand of the scribe. The “yad” is the hand as the reading pointer that follows the text of the Torah. “Yad” is also the Hebrew word for “memorial”. Images of hands are to be found in cemeteries, in Sephardic culture, in Arabic as an amulet or on manuscripts (its aim is to drive away the evil eye). It is a very old Jewish symbol. Tha hand image has also been used extensively by Jewish artists. Chagall’s Self Portrait with Seven Fingers from 1912 reflects the mental universe of the artist, says Philippe Apeloig, and his belonging to the Jewish world. The seven fingers also reflect the Menorah. Paint, ink and chalk were all used in developing the hand icon, with the fingers open for easy recognition. Large scale images lost resolution when shrunk to usable size so later images were originated at 2cm but on grained paper for texture. The images’ “voluntary imperfections” were of course amplified when enlarged thus avoiding computer design’s “mechanical aesthetics”, says the designer. The spiral and hand concepts Apoloig presented to the jury contained ideas of association, combination and mixing. […] A new identity was called for and Apeloig began exploring a new direction, one more simple and at the same time more obvious and less original. The Menorah – the candelabrum with seven branches, a familiar object belonging to the collective memory of the Jewish people – was to be the new direction, encouraged by the jury. Apeloig started exploring the symbol’s plastic dimension rather than its meaning. Its uneven surface planes and primitive appearance spoke of time and reinforced one of the Museum’s objective: the history of Judaism. […] Apeloig was looking for “an image related to antiquity and thus to the fragility of something that has passed through centuries”. Drawings were made using brushes, bamboo and pen before being computerised. Details were studied and calculated, though the imperfection of the hand-drawn originals was retained. The final identity, a candelabrum with the light of the seven flames visible, is reversed from black to white and emerges from a form that recalls coins, seals or stamps. The logo appears as a watermark on stationery, large in area but discreet in intensity […]. The spiral, the hand and the menorah by Philippe Apeloig breaks with conventional book formats by printing all the images and texts (in both French and English) on a long, uncoated concertina fold – if you lose your grip while reading on public transport the contents will cascade halfway down the bus. Apeloig includes sketches for his proposal and final work for the visual identity of the Museum of Jewish Art and History in Paris, and the text explains his measured and respectful progress. Included are a couple of rejected posters: his work does not look like design for, or by, a committee, but the sketchbook of a designer with a personal, thoughtful vision, who articulates his intentions admirably. The inside covers show several pieces of source material, including El Lissitzky’s Shifs Karta and Marc Chagall’s Self portrait with seven fingers, the hand implying a menorah.